These were a HUGE hit at our Paleo dinner party last Saturday. The combo of sweet and savory paired beautifully with our pan-seared roasted pork chops, and they’d also be great as a fall/holiday dish. I highly recommend peeling/prepping your squash ahead of time… it’s not the most fun thing to do, and it seems to take a little longer than you’d think. Not much fun when you’re trying to pull together your dinner at the last minute. 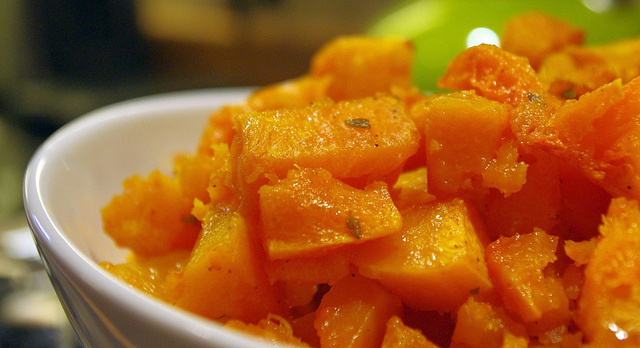 Place cubed squash and olive into a large bowl and toss with your hands. Combine thyme, salt, and black pepper in a small bowl. Sprinkle spices over oil/squash mixture, and then toss well with your hands to evenly coat. Transfer squash to a rimmed baking sheet, spreading it into a single even layer. Roast squash in the oven for 30-40 minutes, tossing with a large spatula halfway through cooking so that it browns evenly. Remove from oven when squash is tender and transfer to your serving bowl. Serve hot and enjoy!